Whether you call it a nieve de piña, a raspado de piña or a chamoyada de piña, it doesn’t matter much. They’re all equally refreshing on a hot day and I’ve included directions for them all, made two ways! Nieves and raspados are more or less the same: flavored shaved ice. And chamoyadas are in the same family, but made a little differently; usually they’re a slushy consistency and you drink them with a straw. I’ve included the directions for both below. It’s been awfully hot in Los Angeles in recent weeks and I’ve been looking for ways to keep cool without heating up the kitchen. I recently saw a photo on Instagram of a Chamoy Dole Whip at an Italian ice joint in Orange County (read: way too far for me to go just for ice cream). So I started to think… How could I make my own version of this amazing treat at home? Enter my Yonanas machine. Plus, making your own fresh fruit soft serve with a Yonanas machine is a really easy way to ensure that your dessert is gluten-free and vegan-friendly if you have dietary restrictions. If you don’t have a Yonanas machine, you can absolutely make this in your blender but you’ll need to add a little bit of liquid to help the pineapple blend without burning out your motor. I recommend pineapple juice, which I’ve included in the recipe below. If you want to make it more like a chamoyada, you can triple or quadruple the amount of pineapple juice until you get a consistency you like. Don’t forget to pour chamoy around the edge of your glass, a little at the bottom and then some more on top! 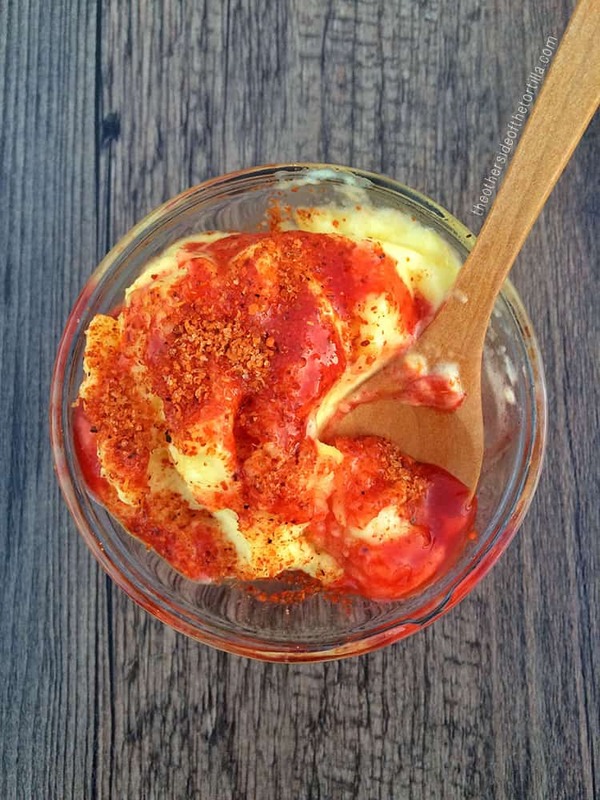 I’ve been known to get a little crazy with my Tajín, so whether you like a little or a lot, it’s really up to you. TIP: I buy frozen pineapple tidbits at Trader Joe’s in the freezer section, but you can also cut your own pineapple and freeze it, or use canned pineapple and freeze on a baking sheet (just reserve the juice in the fridge for later). With a Yonanas machine: Load the Yonanas chute with frozen pineapple 1/2 cup at a time. Place a bowl below the chute, turn on the machine and push down with plunger. Repeat with every half-cup until you run out. With a blender: Add frozen pineapple tidbits and pineapple juice to blender. Blend on high until completely smooth. If needed, pour into a container and freeze for an additional 15-20 minutes before serving. Coat small ice cream dish or bowl with chamoy around the sides to allow it to drip down, as well as a little on the bottom of the dish. 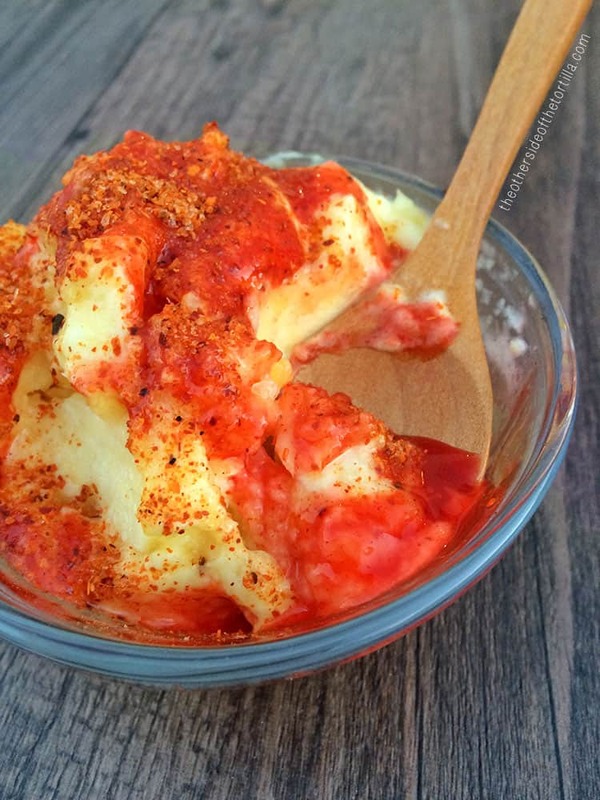 Scoop pineapple ice into the dish over the chamoy. Drizzle remaining chamoy over the top of the pineapple ice. Sprinkle Tajín over the top, to taste. This looks sooooo goood!!! Ahhhh!! I want some RIGHT NOW! Thanks for sharing!